That’s a wrap for the 2018 GUKPT Manchester and what an incredible week of poker we’ve witnessed. No one was going to let Storm Emma stand in the way of them and the £200,000 guaranteed prize pool and Grosvenor Casinos would like to thank all players for supporting the tour despite the adverse conditions. Grosvenor Casino Bury New Road was delighted to welcome 241 entries to the GUKPT Main Event, surpassing the guarantee to create a snow thawing £241,000 prize pool! There can only be one winner and this year the GUKPT Manchester trophy goes to local player Adam Lulat. 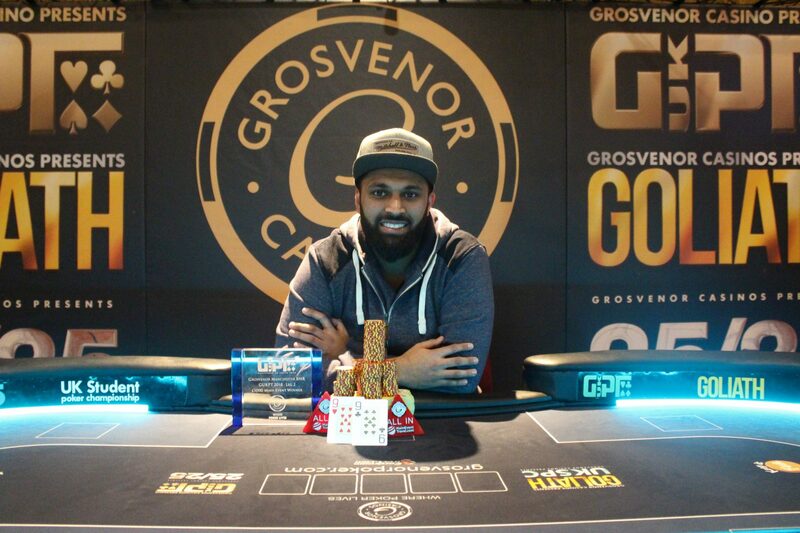 Lulat managed to maintained the chip lead throughout the day despite the best efforts of a final table which featured the likes of Grosvenorpoker.com sponsored player Katie Swift. Ultimately finishing in 8th, Katie is no stranger to deep runs after finishing 9th in the 2015 GUKPT Manchester and of course her extraordinary 2nd place finish in the 2015 Goliath for £46,000. Gary Whitehead, Carl Pickles aand Turgay Bagdagi will also be on cloud nine after not only making the GUKPT Main Event Final but also finishing in the top 3 in the £20,000 GUKPT Mini Main which took place earlier in the week. Attention now turns to the GUKPT Edinburgh taking place from 22nd to 29th April at Grosvenor Casino Maybury, Edinburgh. Players can win their £500+60 buy-in to the £100,000 GUKPT Edinburgh online on Grosvenorpoker.com or at Grosvenor Casino Maybury, Edinburgh.